Within weeks of new funds being announced, the first consultation is launched on a new motorway truck park to replace Operation Stack. But with complications already emerging, can that momentum be maintained? 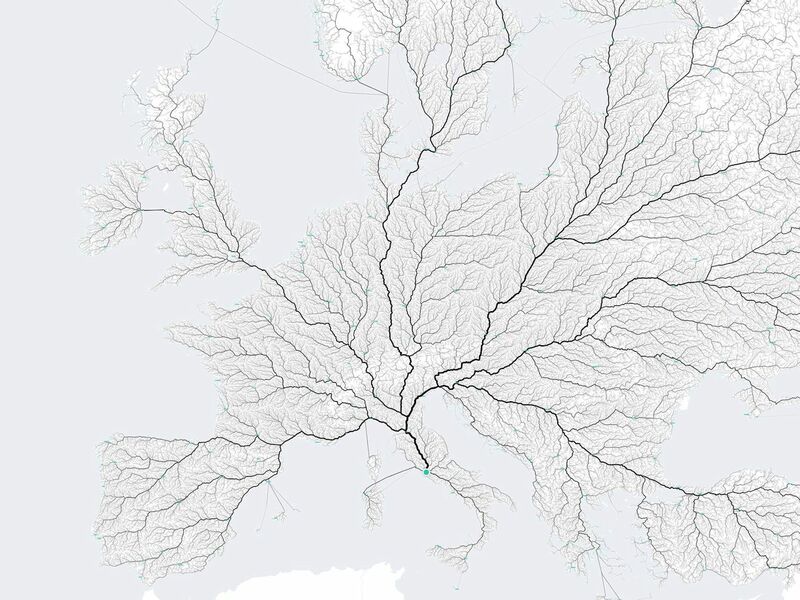 Also, all roads really do lead to Rome say a group of designers from Stuttgart. Road deaths in France still rising overall this year. More go-slow zones in Paris and Grenoble – but a general speed limit is ruled out in southern Germany. 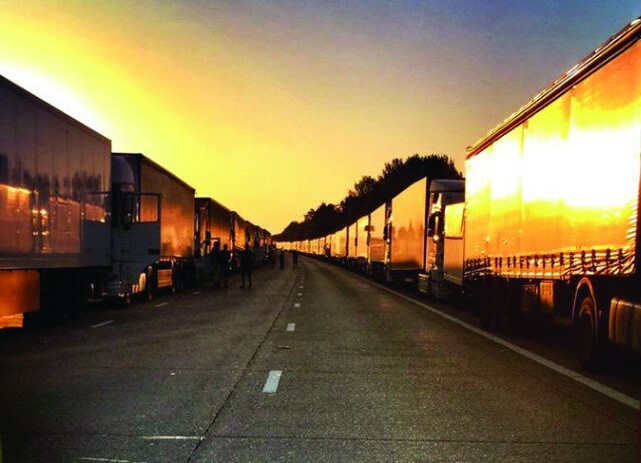 First consultation on emergency or permanent truck park beside M20. Highways England has already identified potential sites for a new truck park near the M20 to replace Operation Stack. It comes after £250 million was allocated to the project earlier this month. Public consultation starts today on two sites, one north and one west (Stanford) of junction 11 of the motorway. The new facility might also double as a sorely needed permanent, 24h truck park, with space for at least 3,600 vehicles. The Freight Transport Association welcomed the announcement. The shortage of truck parking in the area is a serious issue. A driver was killed at the weekend after colliding with a truck on a slip road of the M20. An on-going operation by Kent Police overnight Thursday saw 153 HGVs removed from slip roads and hard shoulders around the motorway. In a letter to MPs last month, Transport Minister Patrick McLoughlin said work to find a long-term replacement for Operation Stack had started ‘well before’ the summer’s disruption but had been ‘accelerated’ as a result. He added Highways England is ‘progressing the project as quickly as possible’. After the new funds were announced in the Chancellor’s Autumn Statement, at the end of November, Kent County Council leader Paul Carter said having the new truck park in place by November 2016 would be ‘going some’. However, Highways England will not need planning permission (according to Kent Online) under Section 115 of the Highways Act though it would need an environmental assessment. The Stanford site would include a new bridge over the M20 while J11 North is further away from the motorway, and close to an Area of Outstanding Natural Beauty (AONB). Both are close to residential properties. Of the four scenarios under consideration, two include permanent overnight parking or ‘truckstop’ services though both would be paid. The first of eight public information exhibitions are being held over this weekend in Sellindge with the rest to come over the next few weeks. This consultation runs until midnight on Monday 25 January. A second consultation, on the single preferred site, is expected to take place in spring 2016. See the consultation documents here. All roads lead to Rome as the old saying goes and three graphic designers from Stuttgart set out to prove it. Actually what they did was select almost 500,000 starting points from all over Europe and plotted the routes to the Italian capital by computer. The roads used the most came out darkest to create this leaf-like pattern. They also plotted similar maps of all the individual countries in Europe, and the states in America. They are all available as posters too, from €8.50. See more at Moovel Lab. roundup: FRANCE. The number of people killed in traffic accidents rose by 3.6% last month compared to November 2014 according to new figures from Securite Routiere. This is half the increase of October 2015 (+ 7.2%) but it pushes up the number of people killed in the first eleven months of this year to 2.1%, up from 2% in the ten months to October. At this rate is looks likely France will see another year of increasing road deaths compared to more than a decade of falls before 2014. It is by no means the only country struggling this year but the problems in France seems more systemic than elsewhere. SPEED LIMITS. Plans are under way to extend 30kmh (18.6mph) zones in Paris. By the spring they should cover around a third of the city, up from 20% now. The main thoroughfares will stay at 50kmh but overall the idea is to have 30kmh as the norm. From the end of next year, 30-zones may cover half the capital. Alps capital Grenoble, which elected a Green Party mayor last year, is another French city planning to go 30kmh – by 1 January, 80% of the city will be covered. Campaign group ’40 Million Automobilistes’ was out canvassing opinions this week with an online survey. More anon. Meanwhile, German transport minister Alexander Dobrindt – him of the ‘foreigner toll’ – has over-ruled attempts by Baden Wurttemberg to impose a general 120kmh limit on the state’s autobahns (which include the A5 Karlsruhe-Basel and A8 Karlsruhe-Stuttgart/Ulm). Baden Wurttemberg has adopted the EU target of cutting accident fatalities by 40% by 2020 and sees reducing the speed limit as the best way of achieving it according to Frankfurter Allgemeine Zeitung. Dobrindt says general speed limits are a national matter though the state may respond with more, localised 120kmh zones.